Tariffs are dominating the news these days with the story changing almost hourly. What countries or industries will President Trump target next? Who will retaliate? 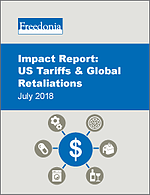 This new white paper, prepared by MarketResearch.com’s imprint The Freedonia Group, draws upon the experience of TFG’s industry analysts to assess the potential impact of the latest tariffs on industries ranging from appliances to wine. This new analysis provides quick, easy to read summaries of how tariffs could impact 20 key US industries.